eBay Plus is a relatively new subscription feature on eBay that provides members with exclusive access to features such as premium shipping or free return shipments. eBay Plus works in many regards just like Amazon Prime. eBay customers pay a yearly fee to become eBay Plus members, and benefit from the features that the membership provides them with for as long as they remain members. You may not have heard of the feature up until now; the main reason for that is that it is only available on eBay Germany and no other eBay marketplace. As is the case with new features, they may be rolled out to different marketplaces once they have been tested for a while. Or, they may be pulled again if they did not yield good enough results. First, the basics. 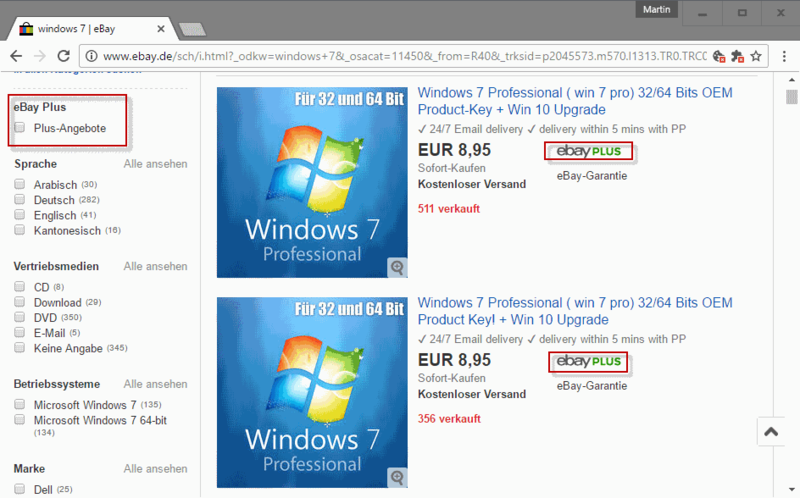 eBay Plus is available for €19.90 per year currently on eBay Germany (that's about $22 or £17). eBay runs promotions currently for 30-day free trials of Plus that users can sign up for to test it without being charged. While you don't pay for shipping for some offers on eBay, you do pay it for others. All eBay Plus offers on eBay don't charge extra for shipping, and are sent on the same day if payments are sent before 14:00 (2pm) on a day. Basically, this is same-day shipping if you buy and pay before 14:00 on any given day. The second feature guarantees free return shipments for items which is not always the case otherwise. The third and final feature brings special offers to eBay Plus members that only they can take advantage of. Only commercial sellers and companies that are vetted by eBay can offer the service. The following video highlights the membership service. It is in German unfortunately. Items are marked with an ebay Plus logo to indicate that they provide special advantages to Plus members. They are not restricted however and anyone can buy them. Interestingly enough, speedy and free shipment seems to be the norm for these articles even if you are not a Plus member. You may filter results on eBay to only display eBay Plus offers on the site. Plus looks on first glance like Amazon Prime of the early days: pay a yearly fee and get free shipping for certain items offered on the marketplace. A core difference between the two membership services is that part of the offers on eBay that participate offer free shipping anyway. This is definitely not the case for all offers though. Additionally, non-Plus members may benefit from fast shipping if they buy Plus items on eBay as many commercial sellers seem to make no difference in this regard. Free return shipments are available for some items for all users, but not for others. Ultimately, its use depends largely on how you are using eBay. If you are a heavy eBay user who regularly sends items back, you may benefit from the membership service. If you are not, or use eBay only occasionally, then it may not offer much benefit to you. Now You: Would you use eBay Plus? Besides this, anyone still using eBay (I mostly use ‘kleinanzeigen ebay’)? Most if not all ‘pay directly’ stuff costs more then if you search via geizhals or other services. There are some exceptions but I often use ‘Alternate’ and check my stuff against Geizhals to ensure I got the cheapest thing. Sadly ebay is now hard business and not anymore what it was. eBay used to be a flea marked on the Internet, now it is a marketplace for businesses where regular people can offer items on as well. They have some good offers sometimes, clothing for instance, and it is the go-to place for many if you want vintage/old stuff. Alternate is awesome, they never let me down. What do you mean by Alternate? It is a shopping site for computer parts and other things in Germany. I think I missed the window on getting a reasonably priced PSP42 but who knows maybe the planets align for me one day. won’t do Amazon Prime, won’t use eBay Prime. Using some spare parts laying around, some re-mixin an et viola! I never liked the feedback thing, it always feels like I am forgetting something, maybe if everyone did automated like this eBay would just get rid of it. IF you make it Better please share..